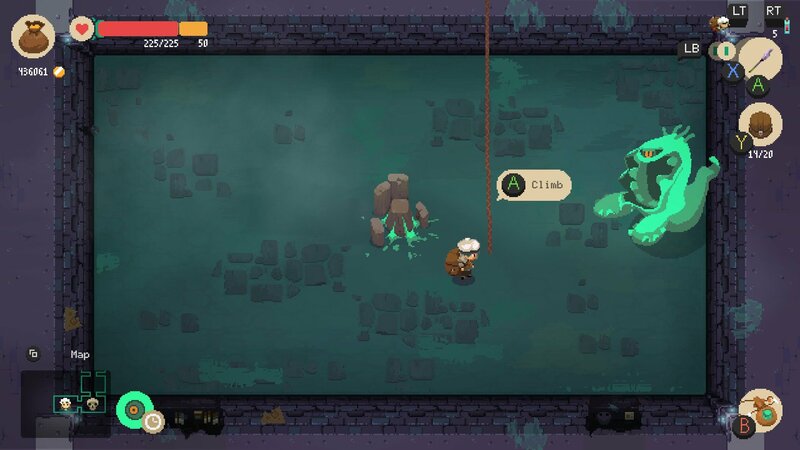 Find out how to access secret rooms and obtain the rare Golem History 1 item in Moonlighter. Moonlighter is all about scouring the dungeons for rare goods to stock in your shop for a high price. The first dungeon you’ll have access to is the Golem dungeon, and while you can find plenty of expensive goods in there, the rarest items won’t appear in your regular exploration. The Golem History tomes are by far the rarest items you can obtain, and there are a couple of way to do so. 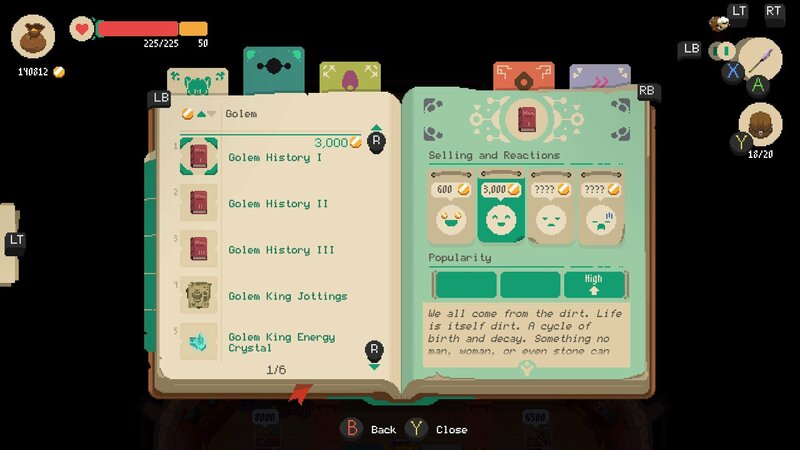 Read on to discover how to obtain the rare Golem History items in Moonlighter. The simplest way to earn the top set of items from the Golem dungeon is to beat the boss. Make your way through all three levels of the dungeon to reach the final door and you’ll be faced with a hulking stone monster ready to bash your mercantile face about. Best this ancient, towering creature and you’re guaranteed to be rewarded with the five rarest items in the Golem dungeon: Golem King Energy Crystal, Golem King Jottings, Golem History 3, Golem History 2 and Golem History 1. 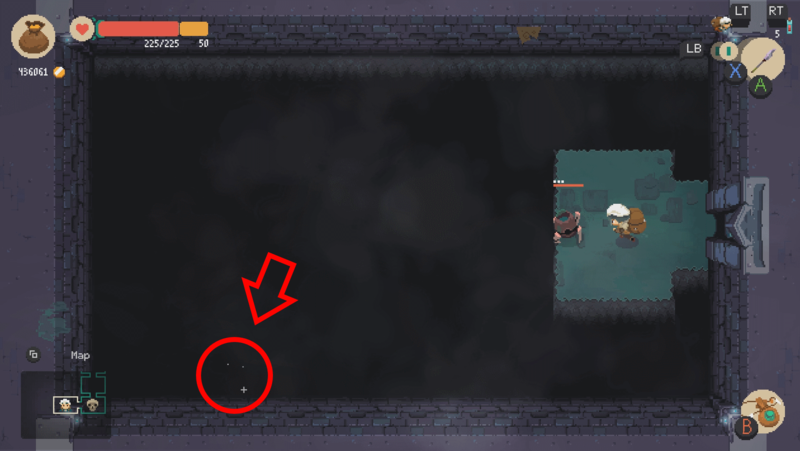 If you want to head straight for the big bad, don’t forget that the healing pool on each floor will always be found on the path to the next level or boss. Beating the Golem King is no easy feat however, and even once you manage it he won’t respawn, making this your only chance to earn the full set in one go. Fortunately there’s another method to obtain the dungeon’s rarest item. While you’ve been exploring the dungeon, you’ll likely have come across dead-end rooms with little more than a giant pit and a few enemies to fight. While most of these serve little purpose, a few pits in the game will actually lead to a secret area. If you see a sparkle effect play over the darkness when you enter the room, this means you can jump down the hole (hit L2 to leap off the edge) to access a new area. Another clue is that the room will appear with a question mark over it on your minimap once you've entered it for the first time. Most secret rooms will only earn you a few more items, but if you leap off into one of the larger pits on level 2 or 3 then there’s a chance you’ll discover an ominous pedestal holding the Golem History 1 tome. Fair warning to any bold explorers however, as placing your grubby mitts upon the sacred tome will instantly summon the ghostly green keeper of the dungeon. This apparition is capable of killing you in a single hit and will chase you through every room (it’ll also appear if you spend too long on any floor). The only ways to escape are to either reach the door to the next floor of the dungeon, or use your pendant to teleport back to town. Don’t panic when it appears — while the monster is certainly deadly, you’ll have plenty of time to activate the pendant and escape with your prize. With an item so valuable and rare it’s important to sell it at the correct price. Check our guide on how much you should sell items for in Moonlighter to make sure you get the best deal.